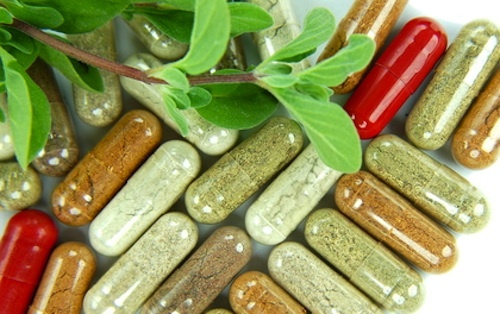 Between 1996 and 2007, use of herbal supplements in the U.S. rose by a staggering 83% . Many people use herbal medicines mistakenly believing them to be safe simply because they are ‘natural’. However, just like conventional drugs, herbal medicines alter normal body physiology. And despite their wholesome image, many herbal products have adverse effects and may have dangerous interactions with other drugs and dietary supplements. New research published in BioMed Central’s open access journal BMC Medicine reveals that most over-the-counter herbal products do not contain any of the key information required for safe use . The products were purchased from two well-known health food stores, three large-chain pharmacies and three supermarket pharmacies. The information provided with these products was compared to safety information provided by the National Center for Complementary and Alternative Medicine (NCCAM), and was evaluated for completeness and accuracy regarding precautions, interactions with other drugs, and side effects. The NCCAM website provides “Herbs at a Glance,” a series of fact sheets that provides basic information about specific herbs or botanicals, including potential side effects and warnings. Each fact sheet was analyzed for content to identify information about precautions, interactions and side effects: 16 points of information were identified for St John’s wort, 11 for ginkgo, 8 for garlic and Asian ginseng, and 6 for echinacea. The analysis was broken down into three categories: regulation, information provided, and key points of safety information. Almost all of the products evaluated (93%) were unlicensed and not required to meet any standard of safety or quality; only 5 were registered or licensed products. Among the 68 products, 59 (87%) provided information on the package and/or on the label only; nine also provided a leaflet package insert. However, three quarters of all products failed to provide any points of information related to precautions, interactions or side effects. Only three products — all of them St John’s wort — contained most or all of the points of information studied. All of the products that were studied are known to have potentially harmful effects for some people. For St John’s wort, which has generated the most publicity regarding safe use as it can reduce the effectiveness of the contraceptive pill and can affect warfarin, which is taken to prevent blood clotting, two-thirds of the preparations failed to mention any of the possible interactions with conventional medicines. The finding is consistent with 2008 study in the U.S., which found that the vast majority of St John’s wort products fail to adequately address clinically relevant safety issues on their labeling . Asian ginseng is not appropriate for people with diabetes and Ginkgo and Echinacea can cause allergic reactions. Even garlic can cause problems for some people because it can thin the blood and interfere with drugs used to treat HIV. Consumers need reliable and comprehensive information when buying herbal remedies — information which tells them whether the remedy is suitable for them. From April 2011 an EU directive requires herbal medicinal products to be licensed, or to get Traditional Herbal Registration (THR), which means the information with the product has been approved. This applies to things like St John’s wort and Echinacea, but not necessarily to others such as Asian ginseng and ginkgo. It also does not apply to existing stock, which can still be sold off. People should look out for the ‘THR logo’ when buying these products. Furthermore pharmacists and doctors need to be made aware what herbal remedies people are taking so that their patients receive the best possible care. Recently, the National Center for Complementary and Alternative Medicine (NCCAM) of the National Institutes of Health unveiled a new online resource on complementary and alternative medicine (CAM) that provides safety and effectiveness information along with links to systematic reviews. This is the same data source used in the study and is freely available to consumers so that they can make informed decisions about the CAM products they use. Herbal Remedies’ Potential Danger. Fit Nation, Time. 2008 Jan 17. Raynor et al. Buyer beware? Does the information provided with herbal products available over the counter enable safe use? BMC Medicine (in press). 2011 Aug.
Clauson et al. Clinically relevant safety issues associated with St. John’s wort product labels. BMC Complement Altern Med. 2008 Jul 17;8:42. Buyer beware — herbal products missing key safety information. EurekAlert! 2011 Aug 8.